All of our senior residents successfully matched into fellowships this year, continuing the tradition of placing residents into high quality post-graduate training programs. Elizabeth Cretara will be attending OHSU Casey Eye Institute in Portland, OR for glaucoma, Dean Loporchio will be heading to Boston University for surgical retina, and Britney Statler will be going to Cleveland Clinic for medical retina. Residents with Dr. King To at the monthly Pathology Conference. The core of the Division of Ophthalmology is our residency training program in ophthalmology at Rhode Island Hospital and The Warren Alpert Medical School of Brown University. The first Rhode Island Hospital ophthalmology resident graduated in 1966, and our we are continuing to grow as an academic division. Dr. Salvatore J. Loporchio reviews a fluorescein angiogram with residents at the VA Eye Clinic.Under the current direction of Division Chief Michael E. Migliori, MD, FACS, Residency Program Director Kimberly V. Miller, MD, and Associate Residency Program Director Wendy Chen, MD, PhD, the training program provides a broad educational experience for its residents and medical students and recognizes that the program's success depends as much on the quality of its residents and medical students as it does on the quality of the faculty. The residency is based at Rhode Island Hospital, the principal teaching hospital for the Warren Alpert Medical School at Brown University. 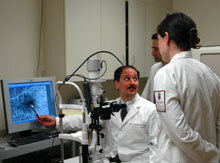 Our residents also operate at the Providence VA Medical Center and rotate through the VA Eye Clinic at Eagle Square. We are committed to increasing the diversity of our housestaff and welcome applications from individuals who would bring additional dimensions to the program's research, teaching and clinical missions. Visit the Brown University Minority Housestaff Association. Our program is one of only a handful worldwide that have an EyeSi Virtual surgical simulator. Located at the Providence VA Medical Center Eye Clinic, this state of the art surgery unit has anterior and posterior segment modules that allows residents to enhance their surgical skills. Not only is the simulator available to residents whenever they want to use it, but there is also a guided course each resident participates in bimonthly with supervised guidance using the simulator. Core competencies and goals regarding the course are established for the end of the first two years in preparation for the third year.